Great rendition of one of those classic but rarely seen designs. Outstanding fabric selections by C Jean Horst. 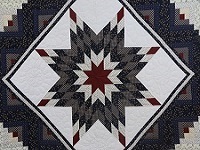 Well sewn and hand quilted by an Amish woman. 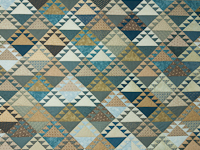 Patchwork quilts were more for warmth in the past, but now they are valued for the beauty of individual choices of fabric and design. 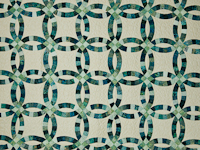 This one is an interesting array of blues and tans that work together to give a warm cottage feel to the room. 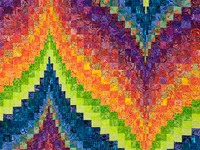 This is a terrific quilt and deserves a beautiful home. 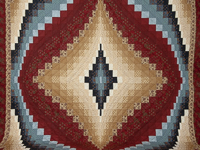 Another striking but unique Bargello design with gorgeous navy and burgundy Moda 100% cotton prints selected by C Jean Horst. Note the care taken with the complicated piecing, and the fantastic choices of border fabrics. Signed by C Jean Horst with a back corner tag documenting that it was hand quilted by an Amish woman and made in the USA and is made of 100% cotton fabrics. 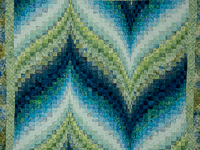 A very striking Bargello design with extra brilliant Batik style color fast 100 % cotton prints selected by C Jean Horst. Note the care taken with the complicated piecing, and the fantastic border fabrics. 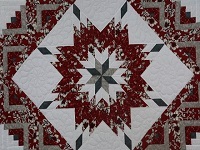 Both pieced and quilted by an Amish friend and signed and managed by C Jean Horst who selected the fabrics and supplied an accurate pattern for sewing as well as oversaw the steps through the project. 100 inches wide by 113 inches long -- $925.